For more information about booking a room at KUF, e-mail us at roomrental@kuf.ca. Unitarian Place at 206 Concession St. is ideal for holding a meeting, class, special event or ceremony. We are conveniently located in the centre of Kingston, between Victoria and MacDonnell Streets, with a large parking lot at the back of the building. The building is equipped with a ramp to the front door, an elevator, and handicapped accessible washrooms. There are washrooms on each of the three floors. 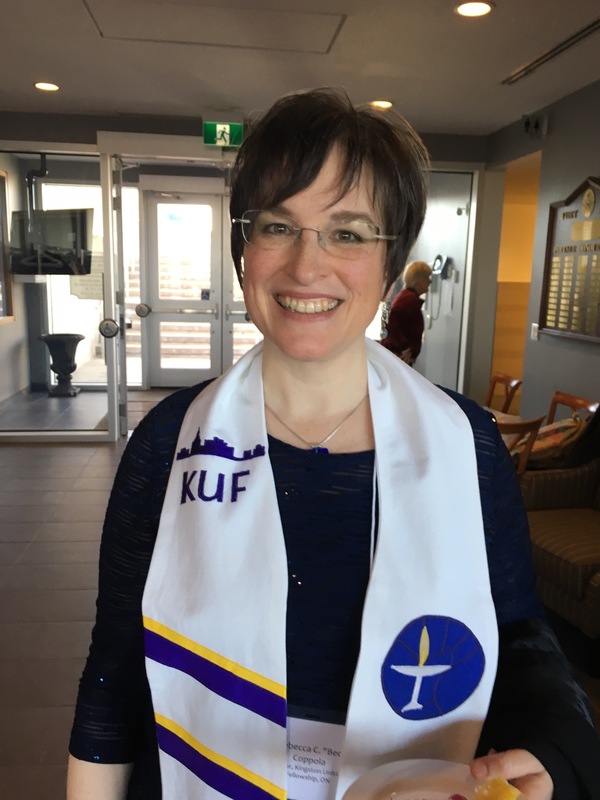 We want you to enjoy renting space from the Kingston Unitarian Fellowship and understand how this works for you and for KUF. We are a non-profit religious group managed by volunteers. As with most churches, making financial ends meet is always a challenge. This is why we have to charge for the use of our space. The building is smoke free and no alcohol is to be consumed there. HST must be added to all rates. The 1500 square feet Main Hall on the second floor can accomodate up to 150 people with catering kitchen adjacent to it. A sound system and a baby grand piano are available, for an additional fee. $50 for 2 hours, $75 for 3 hours $100 for 4 hours, $170 for 8 hours, $225 for all day. The Ed Ratcliffe Room on the second floor is like a living room, with 400 square feet. This room can seat up to 25 people, and has an adjacent serving kitchen. $35 for 2 hours, $42 for 3 hours, $56 for 4 hours, $90 for 8 hours, $125 for all day. The First Floor area is large, about 1400 square feet, and is equipped with several large tables and chairs. There is a serving kitchen at the north end of this hall. $40 for 2 hours, $50 for 3 hours, $65 for 4 hours, $100 for 8 hours, $135 for all day. The Friendship Room is a quiet 400 sq. ft. meeting room on the lower level. About 1400 square feet of space is available for exercise programs or parties on the lower level. $25 for 2 hours, $37.50 for 3 hours, $50 for 4 hours, $80 for 8 hours, $110 for all day. In addition to the rental fee, a security deposit of $30 is required to hold a booking. If you leave the space as you found it – clean, neat, and no garbage or recycling left behind, then we will return or not process the security deposit. If a janitor is needed to clean up, then the security deposit will not be returned. Payments may be made with cheques, cash or by e-transfer. E-transfers for deposits must be made no more than 30 days prior to the event. Payments of rental fees may be made in advance or on the rental day by any of the methods listed. No alcohol is to be consumed on our premises and the premises are smoke-free. The use of the baby grand piano and the sound system in the Main Hall is not included in the base rent. The fee for use of the piano is $30. The fee for the sound system is $20 and includes the use of a podium microphone and a separate hand held one. The event organizer who is to be in charge of operating the sound system must arrive 1/2 hour before the event starts to receive instructions and make sure the system is working. There will be a flat rental fee of $65 plus HST for a student music recital where no entry fee is charged. It includes use of the Main Hall, the kitchen and the baby grand piano for 4 hours. All event advertising notices and posters must refer to the venue as “Unitarian Place 206 Concession St.” according to KUF policy. There is a large sign that says Unitarian Place in front of the building which will make it easier for attendees to find if the advertising information is the same. Contact the rental coordinator by e-mail at roomrental@kuf.ca (mailto:roomrental@kuf.ca), or by leaving a message at 613-544-8777 stating your name, telephone number and what sort of event(s) you may want to hold. The coordinator will respond to your inquiry with information about room availability and answer any questions you may have. A tour of the building at a mutually convenient time can be arranged.